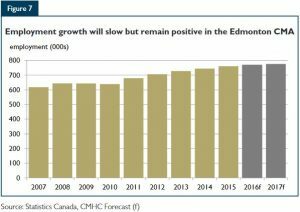 CMHC - Spring 2016 Edmonton Housing Market Outlook - REMAX River City - Commercial | Edmonton, AB. REMAX River City – Commercial | Edmonton, AB. Single-detached housing starts will decline in 2016. 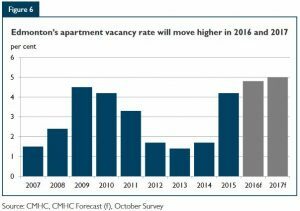 Multi-unit housing starts will move lower in 2016 and 2017. MLS ® sales will decrease in 2016 and post a modest increase in 2017. 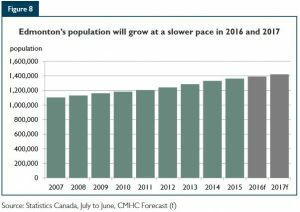 Edmonton’s apartment vacancy rate will continue to rise. Mortgage rates are expected to stay near current levels until the end of 2016, supporting housing demand. Consistent with the view of Canadian economic forecasters, CMHC expects interest rates to gradually start rising from current levels in the first half of 2017. This expected profile for mortgage rates is in line with the Bank of Canada’s view of the economy returning to its full capacity by the end of 2017, according to its April 2016 Monetary Policy Report. According to CMHC’s base case scenario, the five-year mortgage rate is expected to be within the 4.4 to 5.0 per cent range in 2016 and within the 4.7 to 5.3 per cent range in 2017.